The newly decorated accommodations are housed in 3 pavilions surrounding the fantastic pool deck and access to the beach below is just a 3 or 4 minute walk.....to a mile of white sand beach! This villa is particularly suited for guests who have difficulty getting around as the Master Suite is on the ground floor which has no steps at all. From the driveway (which comfortably parks 2 cars), you enter the Great Room with it’s large and comfortably cushioned elephant bamboo furniture for at least 8 guests. Across the room 3 sets of large glass doors open to reveal a large covered porch and ocean views of Jost Van Dyke , Sandy Cay and Green Cay. Large powerful fans silently cool the room with the ocean breezes which flow through the 3 walls of open double doors and the 1 wall of windows. There is a 32” flatscreen TV with DVD player and DirectTV for your entertainment. The shady porch area is an ideal spot for reading quietly in the shade with 2 large chairs and ottomans and it also has a secondary dining table and chairs. This porch leads around to the large pool deck which is partially covered, offering guests space in the sun or shade on the 4 webbed loungers and 2 webbed upright chairs. Also leading onto the pool deck is the large kitchen, which offers all the usual conveniences except a dishwasher. The laundry facilities are for your use and are housed just off the kitchen as is a 1/2 bathroom and separate access to the driveway. The built-in gas grill is under the covered porch leading from the kitchen to the covered dining area with seating for 8. The Master Suite is on the ground floor next to the pool. It has a king size four-poster bed of elephant bamboo and a small private porch with chairs and ottomans for 2. There is a 32” flatscreen TV with DirectTV and a large bathroom with walk-in shower and twin basins. Winding steps from the pool deck lead up to the 2nd and 3rd suites which share a large deck overlooking the pool and ocean beyond. The 2nd suite has a king size bed, AC, 27” flat screen TV with DirectTV and the bathroom has a private outdoor stone-wall shower. The 3rd suite has a twin beds, a 27” flat screen TV with Direct TV and bathroom with shower. 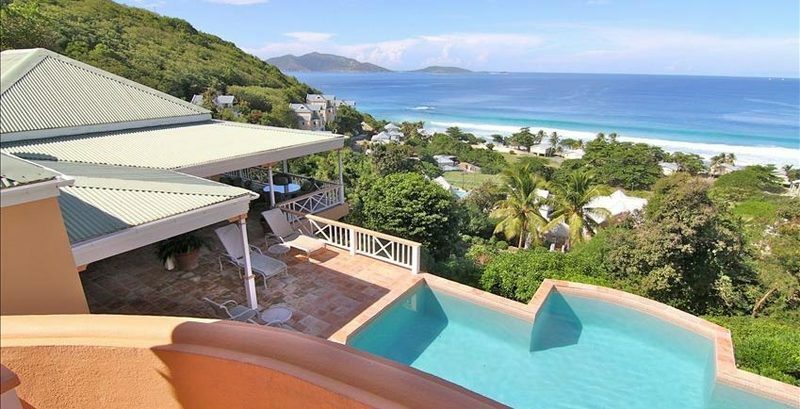 Murray House is a great choice for anyone looking for the quiet of Belmont and West End but the proximity to the beach and restaurants that Long Bay offers. Bedroom 1 - King size bed, en-suite bathroom with alfresco shower, air conditioning, iPod dock, private balcony. Bedroom 2 - King size bed, air conditioning, iPod dock, covered patio. Bedroom 3 - 2 Twin beds, air conditioning, iPod dock, covered patio.